I wrote about the Seattle-based business Blackbird last winter, when I posted a review of their incense cones (which are still favorites of mine). At the time, none of their personal fragrances really captured my fancy; the names were memorable and provocative (Tinderbox, Pipe Bomb), but the actual scents just didn't fit my personal taste. But you just never know: Triton is the latest release from Blackbird, and I've been happily wearing my sample for the past few days. Triton includes notes of violet leaf, iris root, cedar, aldehyde, incense, mimosa, carrot seed, dry amber, vetiver, styrax and black pepper. It was "named after the moon of Neptune that was in turn named after the son of Poseidon," and "its scent carries the nose to the icy surface of its namesake moon. . . . It’s about finding and relishing the beauty of a frozen landscape." It's a tricky fragrance to classify: I'd call it a unisex mineral-earthy-woody scent. I've been wearing Triton in hot-and-humid weather, and it does make me feel cooler (mentally, at least) while taking me on a voyage. It balances chilly aldehydes with warmer, more textured base notes. The aspects that feel most prominent to me are a dry, sheer incense in the opening, a moist, root-y iris and a cedar note reminiscent of pencil shavings. (I particularly enjoy the iris.) I can imagine the smoke and dirt and colder notes as part of a moonscape experience. Yet Triton also reminds me, in a weirdly soothing way, of a cellar: slightly clammy air, damp earth, chilly stone and the musty smell of wood furniture that has been stored in the dark for a while. Triton is reportedly about half-and-half natural extracts, which adds to its convincing "elemental" sensation. Its longevity is on the light side as a result, but I still got a respectable few hours from it on my skin. It could easily be worn by women who like light earthy fragrances as well as men. Thinking about Triton's back-story, I'm surprised that more perfumers haven't released scents inspired by celestial bodies — or have they? I love this idea, and I wish I'd purchased a Cire Trudon Odeur de Lune candle when I had the chance (it's now discontinued). Triton is an affordable and cool way to take an olfactory moon-walk, and it's well worth trying. Blackbird Triton Eau de Parfum sells for $38 (for a 10 ml roll-on) via the Blackbird website. Sample packs are also available. 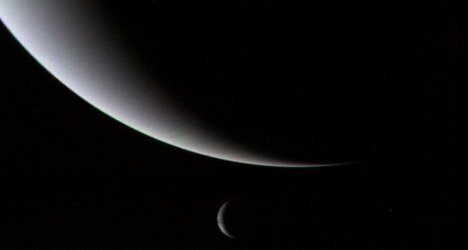 Note: top image of Neptune and Triton [cropped] via NASA. Sorry for my ignorance — how does “dry” amber smell? Morgana, it’s definitely a subjective term rather than a technical one! I can’t speak for the perfumer/Blackbird, but to me, it means more of an emphasis on the woody side of amber rather than the sticky, resin-y side. I’ve only been to Seattle once — and it happened to be a sunny weekend! — but I do love rainy smells and stone-like smells and “cold” smells. They don’t make me feel sad at all, either. Hope you’ll have a chance to try this one! Ooh this sounds neat! I haven’t tried anything from Blackbird yet, but I love the concept. I like their overall aesthetic, and the incense cones are definitely worth a try, too! WOW! Inspired me to go check out the shop, “I’d call it a unisex mineral-earthy-woody scent.” Sounds perfectly me and so reasonable. I hope you’ll have a chance to try it, then! I like the company’s overall style. A fragrance inspired by one of Neptune’s moons! That’s brilliant. I must sample this. I’m trying to remember more celestial fragrances… Sun, Moon & Stars was an old one… but for some reason I’m drawing a blank. I know nothing of Neptune’s moons but I once knew a cat named Ganamede who was named after one of Jupiter’s moons I think. Other than the poor longevity this sounds good. Well, that rooty iris part is a bit concerning but perhaps nestled in among the cedar and other notes it’s not so awful. Some crazy-cat person (and I’m one of them) could use moon-names for a whole house-full of cats! I like that idea. I am equally fascinated/interested and repelled by the description. The violet leaf, cedar (and pencil shavings is what I usually get from cedar) and rooty Iris; however, the damp cellar sounds really yuck to me ever since a real estate agent thought it was acceptable to show me a dank wet basement with the sump pump chugging like a champion drinker. Oh, no — that was a bad idea! Not romantic at all! How synthetic does it smell? I love the kind of thing you’re describing, but I find that most of the time these descriptions also refer to something overdosed with Iso E Super and its kin. Do you get that chemical-spill wave coming off it at all? There is the Oliver & Co Nebulae Series. It was mentioned in NST last December.